Scallop Tacos with Cabbage Slaw are a fun and delicious way to enjoy the fresh flavors of Mexican cuisine all wrapped up in a soft taco. The crunch of the cabbage with the delicate scallops are an addictive combination when wrapped in a warm flour tortilla. The addition of cilantro adds a very fresh taste. So, take a break from the classic taco fillings and enjoy these tacos. These Scallop Tacos will even work with your diet! What is a Scalllop? A scallop is a mollusk that propels itself along the bottom of the ocean by opening and closing its shell. The sweet, delicate meat that we eat is the muscle used to open and close the shell. Good retailers or fish markets should label scallops with the actual count of scallops per pound. 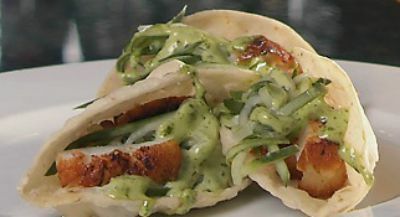 This delicious Scallop Fish Taco with Cabbage Slaw recipe and photo were shared with me by Karen Calanchini, Food Stylist and Photographer, of Redding, CA. More delicious Sandwich Recipes and Scallop Recipes. ** Splenda is the trade name for the dietary sweetener sucralose. This non-calorie sweetener is derived from sugar. Wash the scallops gently and pat dry with some paper towel. In a large re-sealable plastic bag or a bowl, add scallops; sprinkle lemon juice and seasoning salt over the scallops and toss to coat. Cover and refrigerate at least 30 minutes but no more than 1 hour. In a medium-size bowl, combine cabbage, green onions, cilantro, mayonnaise, cider vinegar, Splenda, Tabasco, salt, and pepper. Cover and refrigerate until ready to use. When ready to cook, remove scallops from refrigerator. Drain well, and pat dry (be sure that they are well dried before cooking, so the surface sears, rather than steams). In a large non-stick frying pan that has been sprayed with olive oil cooking spray, heat over medium-high heat until hot but not smoking. When the pan is hot, place scallops in the pan; sear each side for approximately 4 minutes or until an instant-read cooking or meat thermometer inserted into their centers reach 115 degrees F.
Remove from heat. The carryover cooking will add another 10 to 15 degrees, for an ideal final temperature of 125 to 130 degrees F. They should also have lost their translucence and turn opaque. Immediately remove scallops from pan to avoid over cooking while plating (scallops are muscles and will toughen with overcooking). Heat vegetable oil in a large frying pan or griddle (moisten hands lightly with water; rub over tortillas, one at a time). Place tortilla flat into an ungreased heavy frying pan or onto a cast-iron griddle medium heat; turn frequently until soft and pliable, approximately 30 seconds. Remove from heat and stack hot tortillas in a covered dish or wrap in aluminum foil. Keep hot for up to 2 hours on an electric warming tray or in a 150 degree F. oven. NOTE: In place of water, I sometimes use non-stick cooking spray. To Serve: Spoon 1/2 cup of the cabbage mixture onto each tortillas. Add 1/2 of the scallops. Fold in sides and roll up to serve.